The Phantom of the Opera is the new TV show project, broadcasted on the main channel of Russian television, which will engage some Russian singers to show their talent in a genre very different to pop. 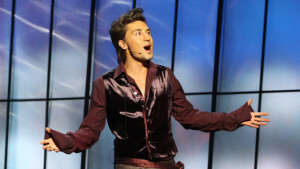 Dima Bilan performed at the premiere of the program singing Gluck’s opera Paride ed Elena. This new TV show, will involve eight Russian stars. Some of them are well-known faces to the Eurofans like Philipp Kirkorov, Ani Lorak, Sergei Lazarev or Valeriya. Each edition of the show will be broadcasted once a week and it will be dedicated to a particular musical genre like opera aria (Russian and foreign), Italian songs, duets… All performances will take place on a stunning stage with a magnificent setting reminiscent of a real theater and an orchestra playing live. The producer of the programme Vasilli Barjatov said that their goal is to show viewers the best part of classical opera using modern media. "Someone could think that it is odd and unappropraite that pop singers are singing arias but, if after seeing the programme, people want to go to the theater to see Carmen or another opera show, we can consider that we are working in the good way" said Barjatov. The jury of the programme will be represented by renowned professionals from opera and ballet like Liubov Kazarnovskaia, Zurab Sotkilava, Roman Viktiuk and Elena Obraztsova. Dima Bilan, who represented Russia twice in the Eurovision Song Contest 2006 and 2008 achieving the 2nd and 1st place respectively, was one of the guest artists for the first programme. He sang a little part of the famous opera called Paride ed Elena (Paris and Helen) composed by Gluck that tells the story of the events between the judgment of Paris and the flight of Paris and Helen to Troy. Dima Bilan is utterly at home in this style, so natural in his phrasing and the way he shades his tone. When he wants to make an intimate point, he draws the listener in by producing a sound that is at once confidential, honest, inviting, tender, and unaffected. Near the end of each verse, he offers an endearing interpretive touch, the kind that some of the finest tenors of the past added to this aria (but too few of today’s singers attempt) a gradual softening of the tone and relaxing of the tempo, giving the music and the words extra personality in the process. Naturally, critical opinions about Dima’s operatic work will be divided but even sceptics must admit that he has the truly special gift of communicating instantly, deeply to an audience, and that this gift comes directly from the sound of his voice, with its timbre, vibrato, and inherent sweetness. What we heard is not a pop singer dressing up or pumping up his voice, but a genuine demonstration of operatic vocalism. You can see Dima Bilan’s performance at the premiere of The Phantom of the Opera below.